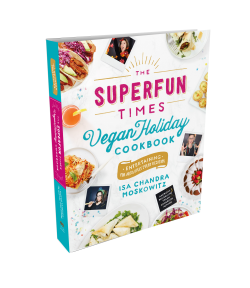 Celebrate all year long with Isa’s biggest cookbook ever! Gone are the days of stressing over how to please family and friends with different dietary needs. 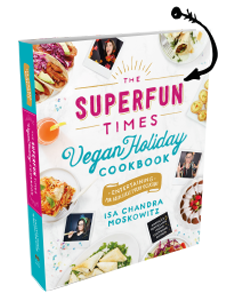 Bursting with knock-your-socks-off, mind-bogglingly tasty vegan recipes for Cinnamon Apple Crepes, Cheeseburger Pizza, Biscuits and Gravy, Churro Biscotti, and so much more, The Superfun Times Vegan Holiday Cookbook will make everyone at your table happy-even meat eaters and the gluten challenged. Isa provides everything you need to get your party started, from finger food and appetizers to casseroles, roasts, and dozens of special sides. Then comes a throng of cakes, cookies, cobblers, loaves, pies, and frozen treats to make you feel like the best dang vegan cook in the world. You’ll start with New Year’s, stop for Valentine’s Day on the way to Easter and Passover, party down from Cinco de Mayo through the Fourth of July, and cook through Thanksgiving, Hanukkah, and Christmas. And with more than 250 seasonal recipes, you’ll mix, match, and remix for every celebration in between–filling your life with holiday cheer the whole year round.